The SureDesk™ allows you to access files on the server from anywhere. The server drives are located under Network Location. The S: Drive is a shared drive, everyone in your company has access to the S: drive, we call this SureFiles™. The U: Drive is a private drive, only you have access to these 'My Documents' and preference folders. The drives under "Other" are the drives located on the computer you are physically using. Through these drives you can access files on your local computer or save and move files from the SureDesk™ to your local computer. The CD/DVD drive allows you to access the files in your CD or DVD. The Local Disk are the drives on your local computer such as the C drive or any other drives that are setup on the computer. The first time you log into the SureDesk™ you will see the message below. This message will appear every time you launch the SureDesk™ on a different computer. Selecting No access will prevent the SureDesk™ from accessing the local computer. Read-only access allows you to view files on the local computer but you will not be able to edit them. Read/write access allows complete access to the folders and files on the local computer. 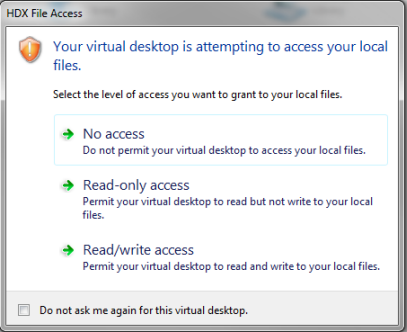 The message will continue to appear unless you check the Do not ask me again for this virtual desktop selection checkbox. If you want to later change the file access permissions move your cursor to the Citrix bar and select Preferences. Click on the Files Access tab to access the above options.